Since BlackBerry launched its cross-platform messenger client in October last year, BBM has grown to 85 million monthly active users and 113 million registered users, the company CEO, John Chen, announced during a conference call today after reporting Q4 results (via TechCrunch). In fact, the struggling Canadian smartphone maker is betting on the growth of BBM, which is a top priority now for the company. To drive growth in registration, BBM will be available on Windows Phone in fiscal Q2, Chen says, and it will be preloaded on Nokia devices in select markets. Besides growing the user base, Chen seems to have a very solid monetization plan for BBM. For example, the company is preparing to roll out an enterprise-grade version called eBBM Suites. 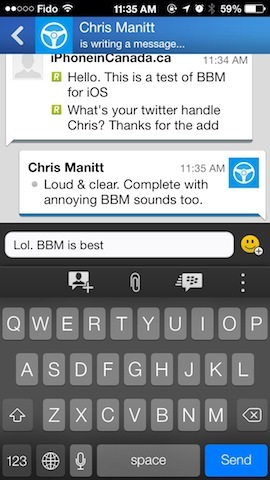 Also, mobile payments to BBM are apparently in the works. BBM launched with great fanfare last fall and immediately surpassed 20 million new users in its first week, topping App Store charts. Since BlackBerry has pushed out a version for both iOS and Android, it has added a number of new features, such as BBM Channels and BBM Voice, allowing users to make voice calls over Wi-Fi or a data connection.